This year, the Grandson didn't give me any ideas for a theme for his cake. I know he's a Liverpool supporter, so a football on a "field" of luscious green "grass" seemed a good idea. But the football's inside will be red! This one cake is to be made from two, seperate cakes, then joined together with inedible internal supports. As he was amazed by the blue sponge of last year's Sonic the Hedgehog cake, it goes without saying that I'm going to try and amaze him again this year. Cake scraps, but what a wonderful colour. 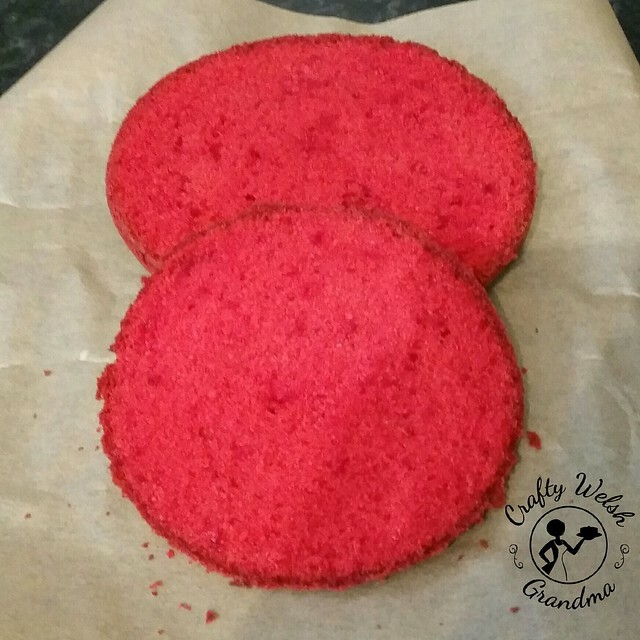 The football is a lovely red sponge, using Trex as a substitute for butter, this will ensure a vibrant red sponge rather than the yellow of the Stork taking away it's brilliant colour. 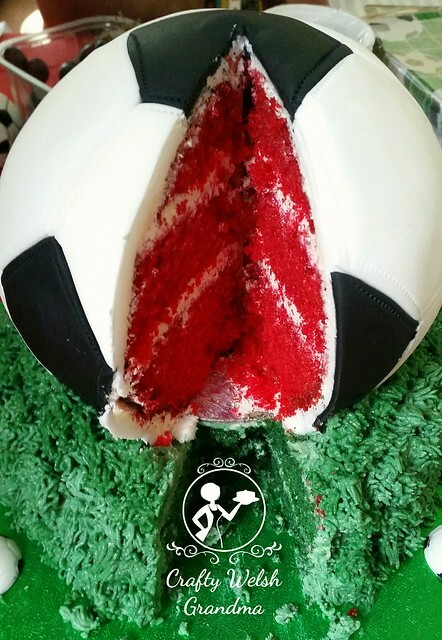 For this portion of the cake, I used the Wilton 3D Sports Ball pan set. The sponge for the green "field of grass" will also be made using Trex, for the same reason as the red spinge and coloured green. For this portion of the cake, I used a standard 8" round pan and two mixes of this recipe for the sponge. 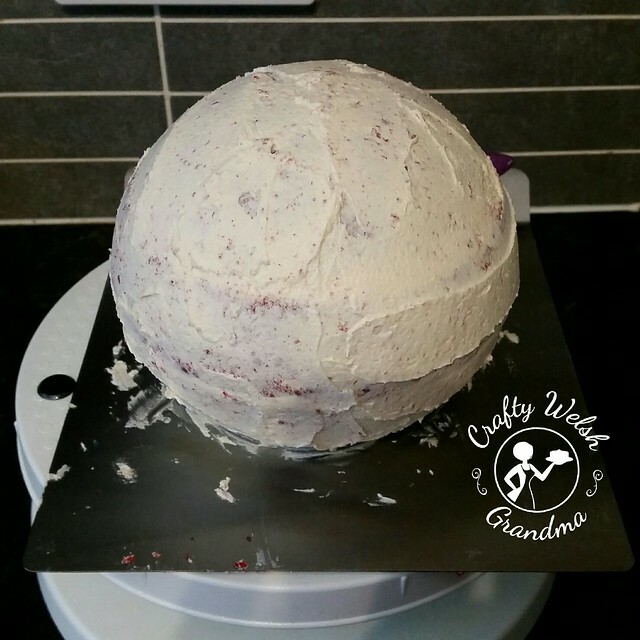 The red ball was crumbcoated in white buttercream which was rather difficult. I'd never crumbcoated a ball before. I have read that, using a piece of acetate helps as it curves around the ball, but I didn't have any. The green part was much easier. 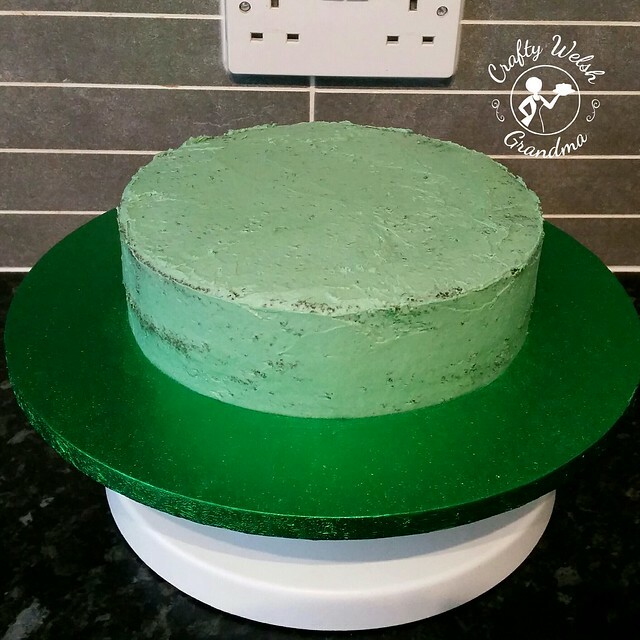 This will not be having fondant top coat, it will have green buttercream, made to look like grass. 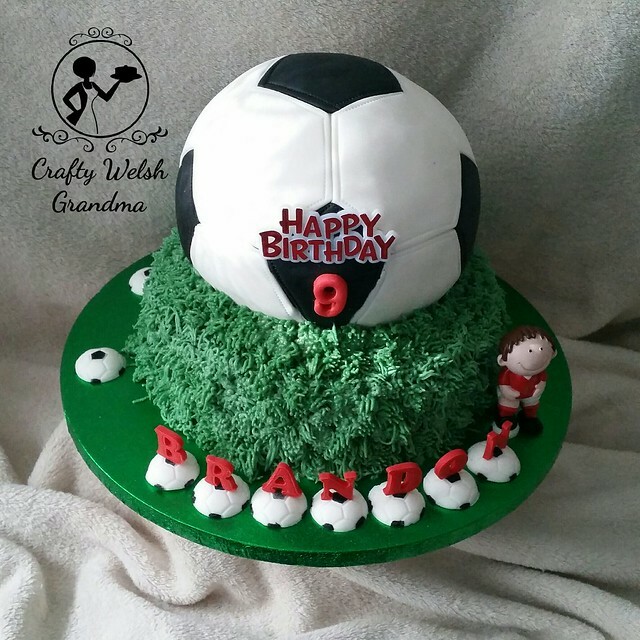 Each football decoration has been hand moulded and hand painted with black food colouring. 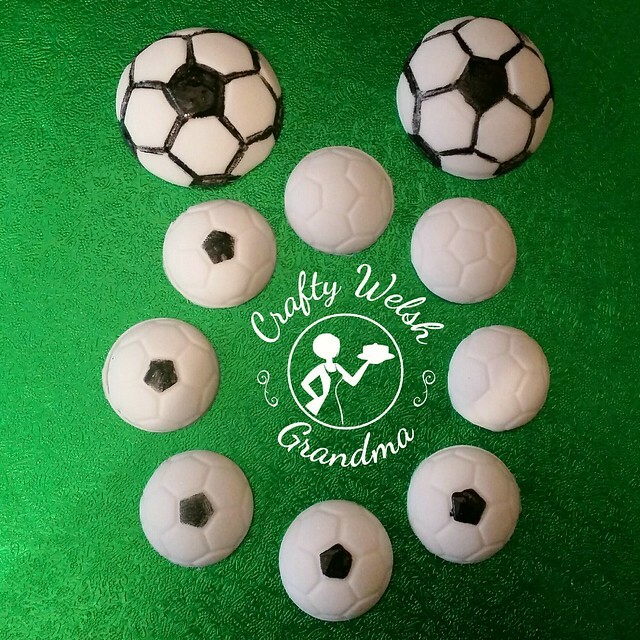 To make these, you could use the Jem Easy Pop Football Moulds. Football decorations, work in progress. I had big plans for this football! But I forgot! The black bits were supposed to have been in red. It just totally slipped my mind. But black and white with the red decorations is cool. There is one thing I am seriously annoyed about! 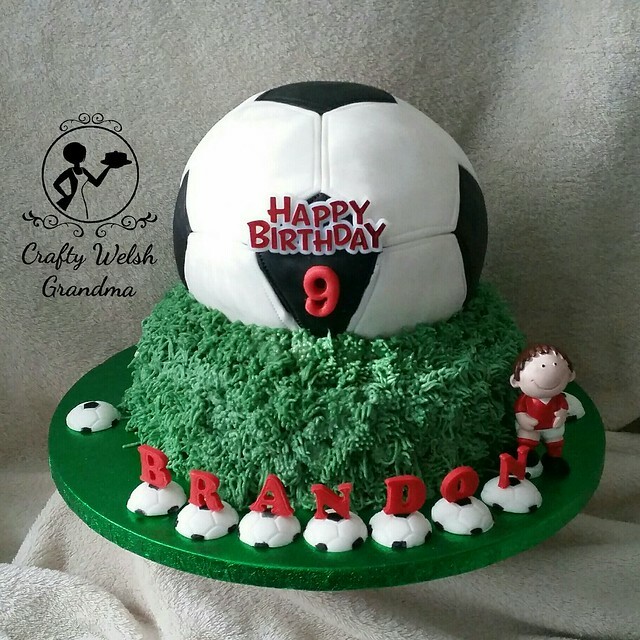 I had six inch pans and the fondant cutters, for the football detail, were designed for a six inch spherical cake. As you can see, they did a terrible job on the bottom half. Tried as I did, and it was a lot, they just would not have it! My next football bake will have me cutting them by hand at this rate. Having said that! My Grandson is a happy chappy and I just know he's going to love it - and be amazed by it too. To me, that's all that matters. ... not having a refrigerator all day! 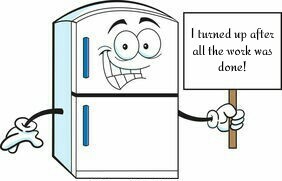 As I needed a new one, which was delivered, damaged and not fit for use the previous day, I had to wait for a replacement to be delivered. This meant, my old one was taken away the day before, for recycling, and I was left with nothing. Working without a refrigerator was difficult, but not impossible. To chill I had to place the cake under netting with a box fan blowing on it. 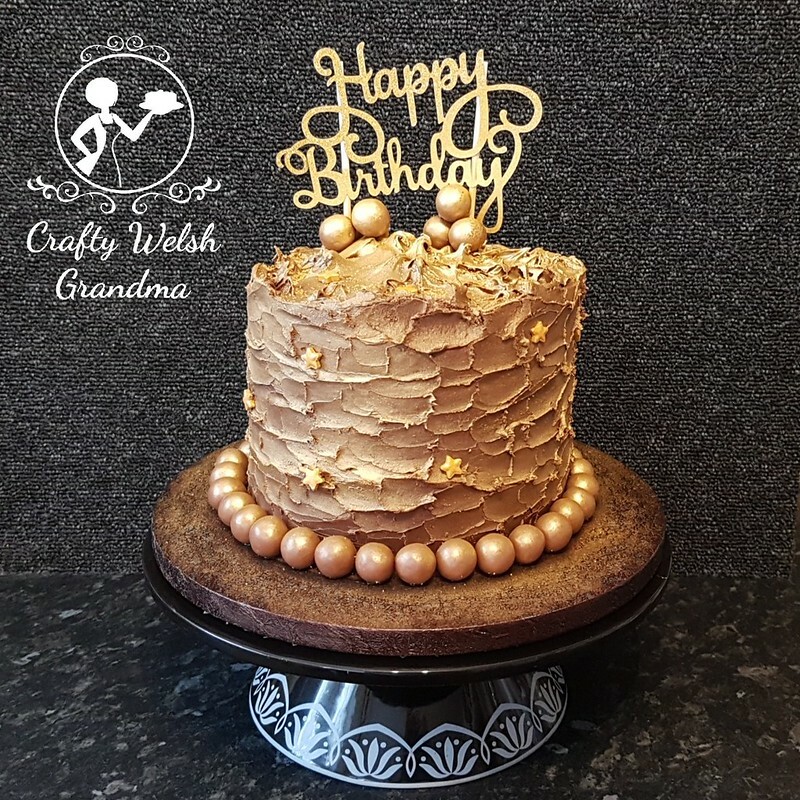 It was not possible to chill the buttercream enough too. 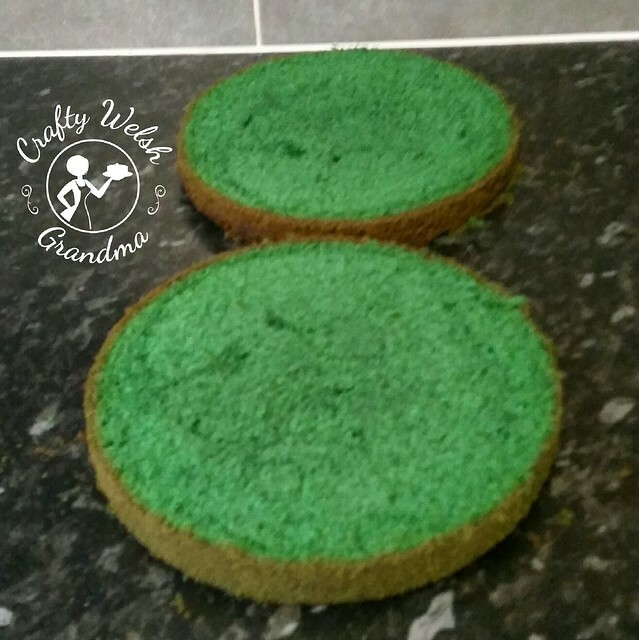 Which meant that the sponge wasn't strong enough to maintain its correct shape and the buttercream "grass" slid and fell off in places. But I think it still all worked out in the end, if a little uneven in places.